We’ve got an unmissable weekend of entertainment coming your way very soon. 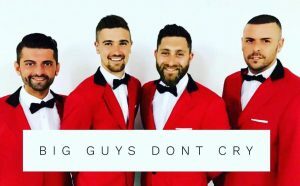 The incredible, crowd-pleasing “Big Guys Don’t Cry” will be back performing live at Tiffany’s Hotel on Friday 17th May. You’ll be amazed at their superior vocals and cheeky crowd involvement. They’ll have you in awe at their unbelievable vocal abilities as they invite you to join them on the dance floor and have you “Join hands” as they march around the sea-view Cabaret Lounge to the cheesy-but-fun “Love train”. We all love a bit of cheese don’t we?